This is what I call a recipe with a story, I promise to keep it short. The hubby and I (and now JD) love going on daytrips and one of the places we enjoy visiting often is Santa Barbara. About two years ago my dad who is a day tripping master, suggested the next time we were in SB we needed to visit the Tupelo Junction Café; well we did and now that is our first stop when visiting Santa Barbara. 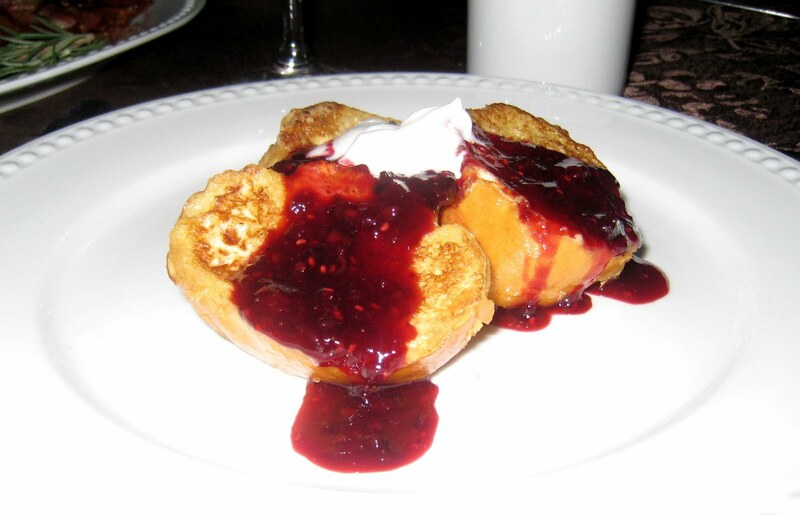 Their breakfast menu is creative and a bit unusual, but their Vanilla Dipped French Toast with homemade berry syrup and fresh whipped cream is to die for. One morning, while feeling very pregnant and hungry, I decide to come up with my own version of Vanilla Dipped French Toast and I’ve been making it ever since. Sunday we celebrated my dad’s birthday by having a surprise brunch and you guessed it, I made my version of Vanilla French Toast (with Mimosas of course). Enjoy! In a medium shallow bowl, mix together the cream, eggs, sugar and vanilla. Dip bread slices into egg mixture, coating both sides generously. On a griddle or skillet at medium heat, melt butter or margarine and cook each slice until both sides are golden-brown. You can place completed French toast slices on a serving plate in an oven set to 100 degrees to keep finished slices warm as you cook the others. Cook fruit with sugar and water until thick. Smash fruit while cooking or you can process cooked syrup in a food processor. Pour your cold cream, sugar and your vanilla into your cold bowl. Blend on medium with an electric mixer until it starts to thicken. If you don't have a mixer you can use a whisk (but it's a workout). Once the mixture has thickened, turn the mixer to high and mix until a peak starts to form in your whip cream.